We already know that veganism has been exploding for years in the U.K.—a 2016 Ipsos MORI poll of 10,000 people found that Britain’s vegan population had increased nearly fourfold over a decade. Now a new report finds that plant-based eating is more popular with non-vegans too. As this group of consumers grows, it is important to consider the motivations of the consumer. Crucially, most plant-based consumers are not vegans but those who are choosing to somewhat reduce their meat and dairy intake. The U.K. is also a world leader in vegan food launches, according to market expert Mintel, which found that one in six food products released in 2018 carried a vegan or “no animal ingredients” claim—pretty impressive. Another recent survey found that nearly 3 million people in the U.K. would try to go vegan in 2019. Roughly 3 percent of the population already identifies as vegan. Luckily, this shift is also happening elsewhere: There were five times as many vegans in America in 2017 than in 2014; France saw a 24 percent increase in vegan and vegetarian product sales in 2018; and Australia had a 92 percent increase in vegan food launches between 2014 and 2016. These dietary shifts go a long way toward reducing suffering. Globally, billions of animals are raised and killed for food each year. Cows, pigs, chickens, fish, and other farmed animals are subjected to unthinkable cruelties: crowded, filthy cages; horrific mutilations; torturous transport; and violent slaughter. If you’d like to do your part to reduce the suffering of animals, help the environment, and protect your health, simply choose to eat plant-based food. 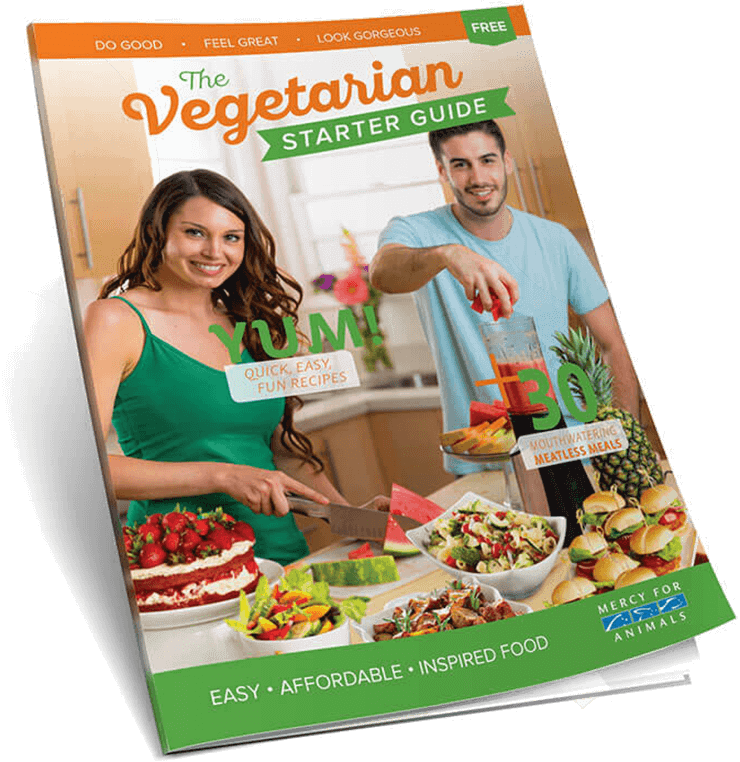 Order a free Vegetarian Starter Guide today, and check out our Pinterest page for thousands of plant-based recipe ideas.